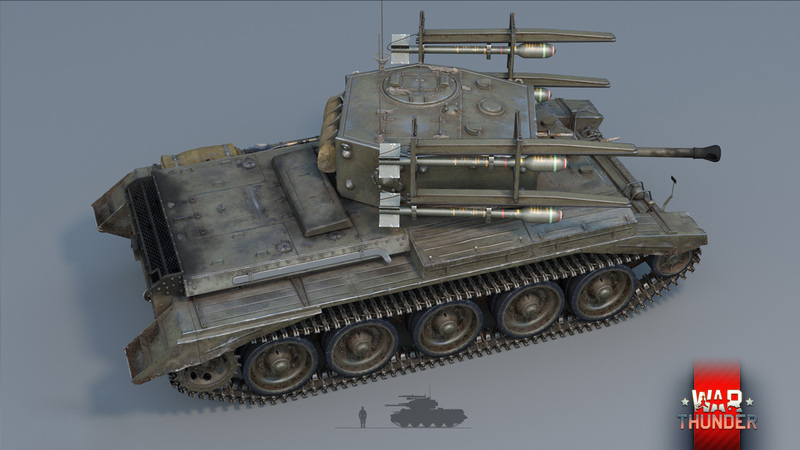 In War Thunder update 1.59 "Flaming Arrows" , we’re adding several tanks armed with ATGMs at once. 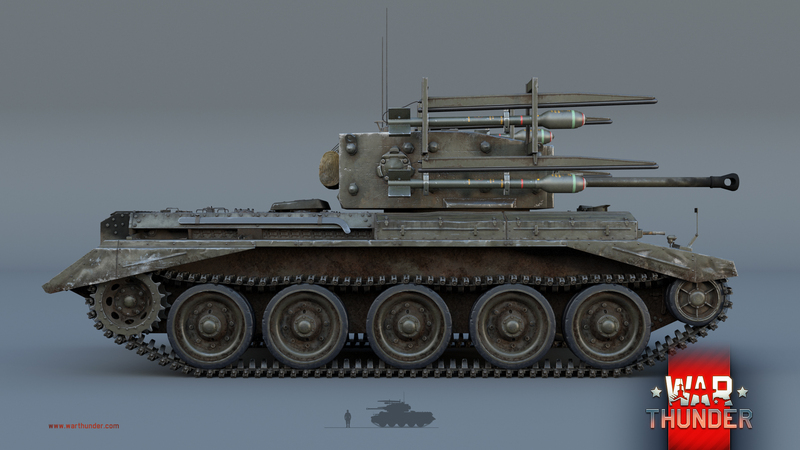 On top of that, we’re continuing to work on tanks with unguided rockets. Today’s hero is the British Cromwell RP3, armed with aircraft rockets! The success of multiple rocket launchers and experiments with installing unguided rocket launchers on tanks could not fail to catch the interest of British tank designers. 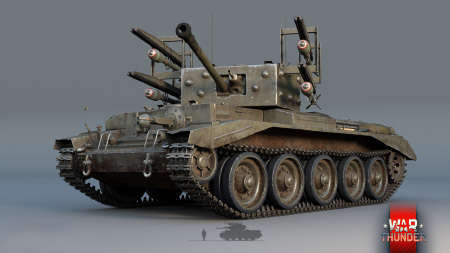 In 1946, British engineers performed an experiment with aircraft rockets on a Cromwell tank, installing four immobile rocket rails on a welded frame. With the help of some clumsy fixtures, standard aviation rockets were mounted on these rails. They were designed to destroy submarines and ships, but in practice were widely used during assaults on ground targets. And so the Cromwell RP3 was born, an experimental rocket-equipped tank, which, unfortunately, was outdated as soon as it was created. 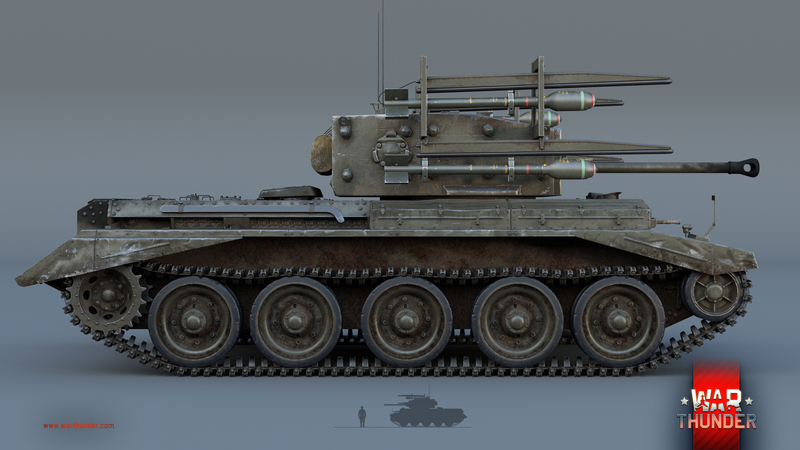 Although the tank had no place in the Cold War, the rocket-equipped Cromwell is most welcome in War Thunder! 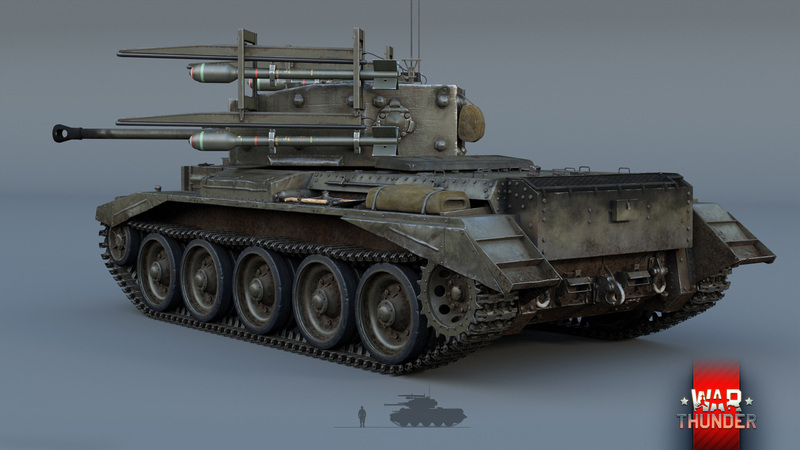 The first and so far only tank with unguided rockets in the British tech tree, this vehicle is sure to find fans among our players. The tank has just one flaw – its rockets can be aimed only by turning the tank’s turret, since its rails are immobile. The tank’s advantages are everything else. Four semi-armor-piercing rockets (the same as those used on the Hurricane Mk IIb fighter) cause extremely heavy and sometimes deadly damage to any opponent at the tank’s rank. 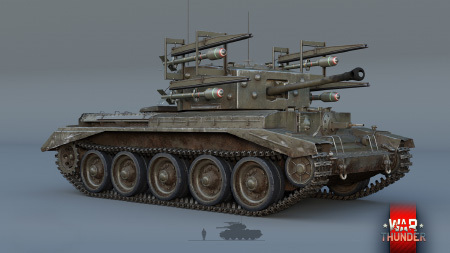 Since the rockets are hard to aim and there are only four of them, the rocket-equipped Cromwell’s Battle Rating will be the same as a standard tank (at least, when the update is released). For tankers experienced with the Cromwell who know all its strengths and weaknesses, these aircraft rockets will be an excellent addition for destroying enemy tanks. Yes, this tank has its own ‘finisher’! The Cromwell RP3 is a Premium rank II tank in the British tech tree. 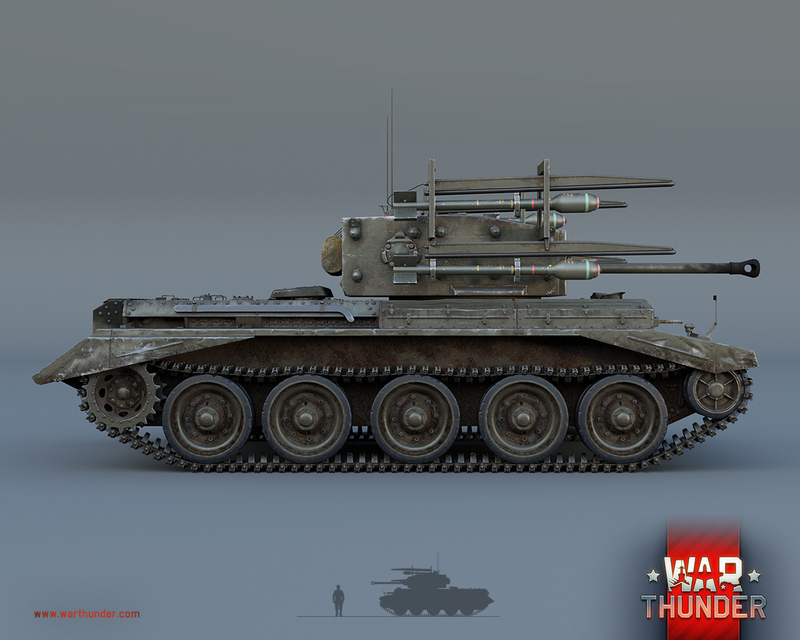 This news and improved vehicle will arrive in War Thunder in the update 1.59 "Flaming Arrows"! I've been waiting for this vehcile and here it is! Looks great, keep up the great work. Yer I've been waiting to see this tank too. Otherwise known as the Tulip. This game is clearly heading to Pay to Win ever since the release of the Calilope. Im afraid thats just not the case. All previous rocket tanks have been premium and thats not because of any "pay to win" factor. Its simply because a complete rocket tank tree could not be constructed for each nation as well as to ensure they were limited. If they were reachable, there would be rushes of rocket tanks that would not be to everyone's tastes. Its also worth pointing out, whilst these tanks may have the offensive advantage, they are also massively at a disadvantage because all open top rocket racks are essentially unarmored and unprotected ammo racks. I agree my friend pay to win!! Sweet, are we expecting more low tier rocket vehicles for other nations as well? This is clearly a "Rocket update for wt. Enough with the rocket tanks and give us some normal tanks please! All unguided rocket tanks have been premium in the past and this one is no exception. Since a whole rocket tank tree could not be created for each nation and to ensure they were limited, they are best suited as premium. If they were not premium, there would be far too many on the battlefields to which people would not want. AWFUL. Thank god it's only a premium. Tanks are getting worse and worse.